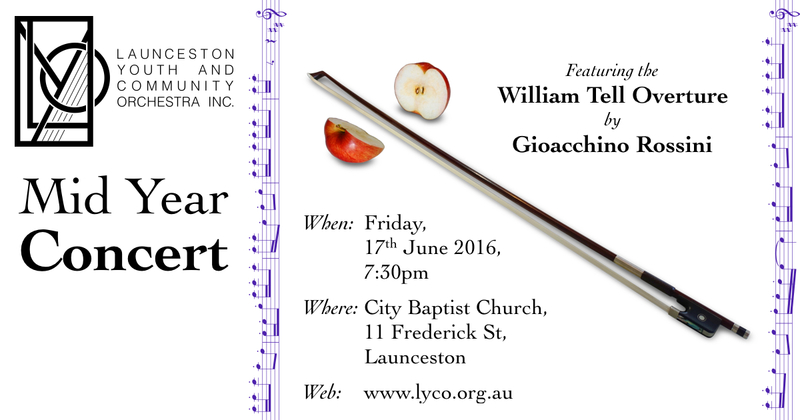 Highlights will include the Intermezzo Strings playing movements from Peter Warlock’s “Capriol Suite” and the Launceston Symphony Orchestra playing the Overture to “William Tell” by Gioacchino Rossini. Frequent concert guests may recognise the “Sixteen Sensations” by Australian composer Stephen Chin. Pieces from this collection have appeared at the Residential Summer String Camp in 2012, 2015 and 2016, and the LYCO 2015 Mid Year Concert and 2015 End of Year Concert. At the 2016 Residential Summer String Camp, the Preludio Strings played the first sensation, “Gecko Echo”. Now, at this concert, the Piccolo Strings will for the first time perform the final two sensations, “Bubbles” and “Fiddle Stick Fury”. You may find it at Winter Orchestra Workshop – 2016 Federal Election. For the 2016 Mid Year Concert, the Intermezzo Strings are playing movements from the “Capriol Suite” by Peter Warlock. This work requires careful listening. Some moments are filled with beautiful harmonies, others are written to be so harsh that our teeth grind. How can we learn the difference? Listening to a recording can help, especially if you read your part while listening. As it happens, the LYCO already has a recording of the Capriol Suite, made during the 2006 Residential Summer String Camp. You can listen to it in the RSSC 2006 Gallery.